keeping two in a tank is not a good idea. The smaller one will get beaten up. The size of tank or number of hiding places do not matter. My experience with BGK fish. I had started off the same as you with 2 small BGK in a small 2ft tank. And i thought they were territorial so i gave them many hiding places. But whenever they would cross paths the bigger one would always attack the small one. Soon i upgraded my tank to a 3.5 ft. 55gal Tank. This did'nt help much because they grow so fast that they were already around 7-8 in each. And the aggression got worse, finally i separated them but i think it was too late. The smaller BGk kept falling sick and i couldnt keep her alive long. The Larger male BGK is 15-16" large now and loves it being single in my 4ft 90 Gal planted tank. I have kept 2 PVC pipes in the background behind some large driftwood. He sleeps there during the day, just coming out for a couple of minutes searching for food during the day. But as soon as the lights goes off he rules the tank. He also eats out of a feeding spoon now. I really love this fish. keep the water clean by doing 20 percent water changes every 3 days or so, and a really good filter. Avoid sudden temp fluctuation, don't overcrowd fish in its tank. give it a nice place to hide in. feed liver, live food, tetrabits, keep this up for years, at least 5 different and nourishing food types, you will have a healthy fast growing BHK. In winters, do not add cold water to the tank, heat it till it is the same temp as the aquairum water. The previous mesage was in response to how to keep BHK free of ick. I also wish to add that if the fish gets ick, then heat treatment method is best, not meds. But ti should bne done half the rate, that means, heat the water over the course of an entire day or two, not in a few hours. you have a fish that is proof of your excellent fishkeeping. What a monster you have now! my BHK never had that intimidating look! 2000 Rs for Hikari food? is it imported? because I dont think Hikari products are that expensive. Have you checked LFS for this hikari food? I have been using Hikari Micropallets & First bites for my fancy guppies & their babies and both are reasonably cheap(when I say reasonably they are still expensive than local brands ...). Hikari tropcia flakes or goldfish flakes, for 15# bucks, are available in delhi. last for 2 months, excellent value. 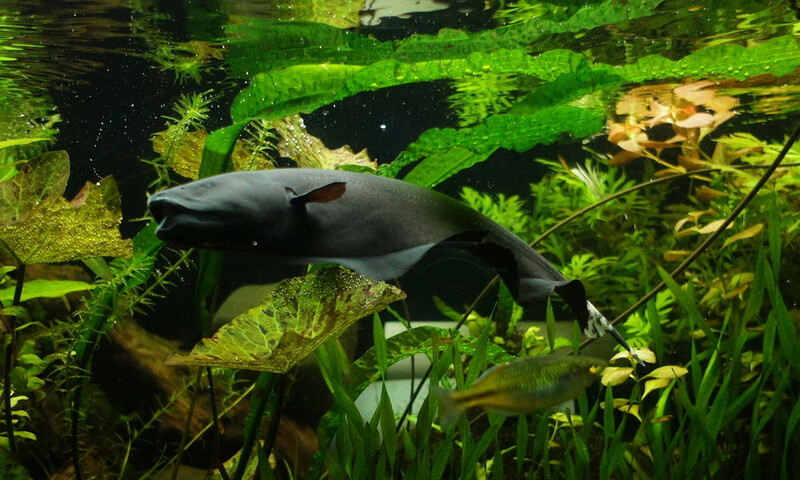 BTW, black ghost knifefish do very well in planted tanks, so i dont agree with the idea that they are not platned tank fish at all. Mine love plants, never damage them, and seek their cover too. i kept BGK in past (7inch). Nope.. guppys and tetras are good snacks for them. They will eat any fish that can fit in its mouth. Yup.. they rip your guppies.. I had kept Black ghost knife along with 4 pairs of butterfly guppies without knowing & the next day I could find only 1 that too without its tail..
@Romi Excellent advise. Thank you. They love plants and hide behind them a lot. Was concerned about Ich since I recently lost 4 Dwarf puffers kept in a separate tank due to Ich. I was able to source a local fish food stick that contains beef heart. It is a bit hard, but the BGK chomp, spit it out and then swallow them.